By John Angiulli, Volusia County Director of Public Works, and Harry Lorick, Principal, PE, PWLF, LA Consulting, Inc. Execution of recommendations based on two evaluations for Volusia County, Florida has now saved the County more than $30 million since 2008. The County implemented many of the recommended improvements as described in the two evaluations for the Public Works Department that were conducted in 2007 and 2009. With a considerable investment of time and resources, the County desired to determine the impact and results of their efforts. In 2017, the Department management and County leadership initiated a proactive effort to evaluate the before/after results from these two previous evaluations over the past 10 years. Volusia County is approximately 1,232 square miles and is located on the northeastern coast of Florida, south of the City of Jacksonville. In 2015, the population of the County was 510,495 with the majority concentrated in two main population regions. One region consists of the 10 cities located to the east along 47 miles of coastline, which includes Daytona Beach, New Smyrna Beach, Edgewater, Holly Hill, Port Orange, South Daytona, Edgewater, Oak Hill, Daytona Beach Shores, and Ormond Beach, and the western region of the County, which has historically been a rapidly growing portion of the County and contains six cities including Pierson, DeLand, Lake Helen, Orange City, DeBary, and the largest city in the County, Deltona. The central region has the greatest area of unincorporated and undeveloped land. Volusia County is the 11th most populous county in the state. Between 1990 and 2000, the population growth rate decreased by 19.6 percent, but increased 15.15 percent from 2000 to 2015. From 2000 to 2015, the incorporated population averaged approximately 77 percent of the total. The County is projected to grow an additional 5.89 percent between 2015 and 2020; whereas, the current growth rate in the state overall is 2.6 percent. The County has several major tourist events throughout the year that impact operational requirements. The impact includes service for the additional population and generation of major traffic congestion, as well as event-specific work that must be performed. This substantial temporary increase in population creates the need for considerable services from the County in general and, specifically, from Public Works, including special event planning, traffic control, debris removal, and monitoring beach patronage. The Public Works Department is one of four departments that report to one of the two Deputy County Managers. The Department has seven Divisions, which include Coastal, Engineering and Construction, Mosquito Control, Road and Bridge, Solid Waste, Traffic Engineering, and Water Resources and Utilities, all of whom report to a Department Director. The Department has 451 full time equivalent (FTE) employees and is responsible for 1,054 centerline miles of road, of which 968 miles are paved and 86 are unpaved. Other notable responsibilities include 14 utility plants, 500 plus square miles for mosquito control, 47 miles of public coastline, and active Class I and Class III landfills. Since the 2007 evaluation, the innovative business practices outlined in the recommendations of both reports were successfully implemented through the willingness of the Department to change and their commitment to continuous improvement. The County also selected a computerized maintenance management system (CMMS), Lucity, and the results have been impressive, with several industry awards and acknowledgment by peers of their success. In summary, the Department has accomplished more work with less equipment, fewer dollars, and nearly the same number of employees. The following provides some general details of the changes and savings realized by the Department. Several factors, along with a variety of operational data sources, including Lucity work order data, were considered when evaluating the changes. The Department realized significant savings in several areas related to O&M after the implementation of the initial recommendations from the 2007 and 2009 evaluations. This represented approximately $2 million in savings. The following are just a few noteworthy results. The Mosquito Control Division saved $721,000 by reducing internal helicopter maintenance needs via outsourced support, the full allocation of overhead billing, and combining two maintenance yards into one. The Solid Waste Division saved $431,000 through the elimination of unnecessary holiday and Sunday support and the modification of work methods for alternative daily cover at the landfill. The Road and Bridge Division’s Drainage Task Team (DTT) saved $175,000 annually through the elimination of inefficient internal billing methods, as well as the elimination of travel and redundant activities already performed by either the Road and Bridge or Mosquito Control crews. Water Resources and Utilities Division saved $539,000 by reducing water loss and unnecessary capital costs. The County’s Economic Development Department reports that the County’s population in 2016 was 521,338 (Volusia County Economic Development, 2017). Over the past 10 years, the County saw a 3.8 percent growth in population with a projected increase of 8.4 percent by 2025. The County’s Comprehensive Annual Financial Report (CAFR) data from 2006 through 2016 shows that most asset classes related to Public Works have increased. The largest percentage increase has been in ditch miles (75 percent), bike paths (74 percent), and sidewalk miles (21 percent). Other asset classes that increased include paved roads, signalized intersections, water mains, sewer mains, and lift stations. The CAFRs also reflect changes in other operational indicators that are not assets, such as the decrease in refuse collection of just over 20 percent, the increase in water customers of just over 4 percent, and the increase in sewer customers of approximately 4.8 percent. In the Coastal Division, the number of visitors to beach and inlet parks increased 9.6 percent during the period. The overall impact of all the asset classes is over a 7.5 percent growth in assets with many categories having even more. The amount of labor budgeted over the last 10 years was adjusted for inflation using the ENR index (ENR, 2018) and showed a reduction of $3.8 million, or 16 percent. The number of budgeted employees increased by three positions. 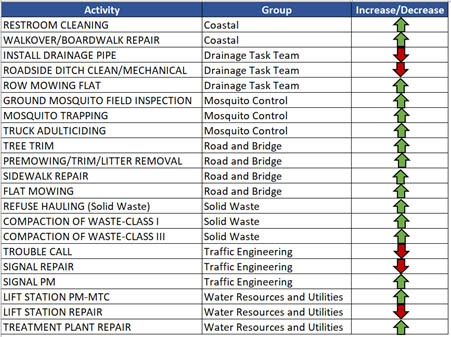 Coastal, Mosquito Control, Traffic Engineering and Solid Waste staffing decreased, while Road and Bridge (R&B) increased as they took responsibility over all drainage maintenance from Mosquito Control, as well as signs and markings from Traffic Engineering. Utilities had a slight increase of two staff even though they gained more assets and mandated responsibilities. The overall staffing of the Department showed just a slight increase in staff of 0.8 percent. Considerable changes have occurred in equipment with a reduction in the total inventory between 2007 and 2016. Some of the reductions are heavy equipment such as transfer hauling units, graders, and bulldozers. The Department reduced its number of equipment from 735 to 702, or approximately 4.5 percent. All groups except Utilities and R&B Drainage had reductions. R&B Drainage numbers increased due to the transfer of vehicles from Mosquito Control. Mosquito Control no longer uses heavy equipment for ditch and canal maintenance, but instead relies on R&B Drainage to perform this function. Through better scheduling, efficient allocation of resources, and management decisions, overtime was reduced dramatically following the 2007 recommendations. Overtime averaged nearly 9 percent of the total reported hours in FY2005 and FY2006. Overtime, as a percentage of all working hours, fell from 7.2 percent in 2007 to around 4 percent during the last several years. The measurement and monitoring of average daily productivity (ADP) is another performance indicator used by high performing organizations. It represents the average crew productivity that was reported for multiple jobs doing similar tasks. Utilizing data from the Department’s Lucity CMMS, the Department’s top maintenance and repair activities have shown an increase in average productivity by more than 10 percent. Figure 1 shows a summary with several of the top activities by group, comparing initial Lucity production data from 2010 with that of 2016. Most (16 out of 21) of these activities have seen productivity increases. It should be noted that reductions can also be a positive reflection on O&M practices. For example, the correlation between Traffic Engineering’s activity of signal preventive maintenance and the activities of signal repair and trouble calls. The same correlation can be made between lift station preventive maintenance and lift station repair. The increase and focus on preventive maintenance has a positive reduction in the possible repairs of an agency’s assets. Over the past 10 years, the Volusia County Public Works Department has implemented innovative practices through their commitment to continuous improvement, a dedicated workforce, experienced managers and directors, as well as the support of senior and executive leadership. The Department’s commitment to an efficient operation can be quantified using the prior mentioned factors. The Department saw an original savings of $2 million during the initial implementation phase, as well as a $1.9 million reduction in equipment costs due to right-sizing the equipment inventory during the 10-year period. They have also realized a productivity increase of 26 percent, or $2.9 million in savings annually through productivity and a decrease in personal services costs. This equals to an approximate savings of over $30 million during the ten-year period. In addition, although the County saw an increase in both total population and assets to be maintained, Department staffing increased less than 1 percent. In 10 years, the County is doing 10 percent more work, while the labor cost is 16 percent less. 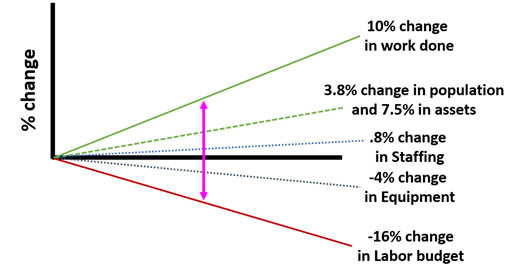 The difference in the purple line in Figure 2 is savings of 26 percent through a combination of lower costs and getting more accomplished (greater productivity). It should also be noted that if staffing was only linked to population, the amount of staff is 3 percent (3.8 to 0.8 percent) less than would be expected and, if linked to assets to be maintained, it would 6.7 percent (7.5 to 0.8 percent) less than expected. The 26 percent savings precludes the 4.5 percent reduction in equipment. This improvement is further demonstrated in Figure 2. The 10-year assessment indicates that the County is doing more work with less equipment and financial resources with about the same number of staff. This is not to indicate that further improvement cannot be made, but rather that the data shows that significant improvement has occurred in the last 10 years. Volusia County Public Works, staff and management, is to be congratulated for accepting an independent report’s ideas and then for making the effort to implement those ideas. The consequences of these efforts have resulted in considerable benefit for County residents by optimizing the county workforce and the resources while reducing overall cost. Florida Legislature Office of Economic and Demographic Research. (2017). Volusia County. Tallahassee: Florida Legislature Office of Economic and Demographic Research.